I went to your session at NCTE this past fall. I was so impressed with this multimodal form of composition and literary analysis. I found the chapter Holbrook and Hundley had written about it in a book my colleague Kristy Pytash edited to learn more about scaffolding the teaching of this assignment for my undergrad students. Creating a hypertext literary analysis will be the final for the teaching writing course this semester. I am so glad you shared more about it on this blog posting, especially the tutorial on how to create hyperlinks in PowerPoint. This is so helpful! Thanks for reading this blog and your response. The forthcoming chapter cited will also include links to some supplemental materials Nicole Renner and I developed (e.g., assignment sheet, graphic organizers, rubric). 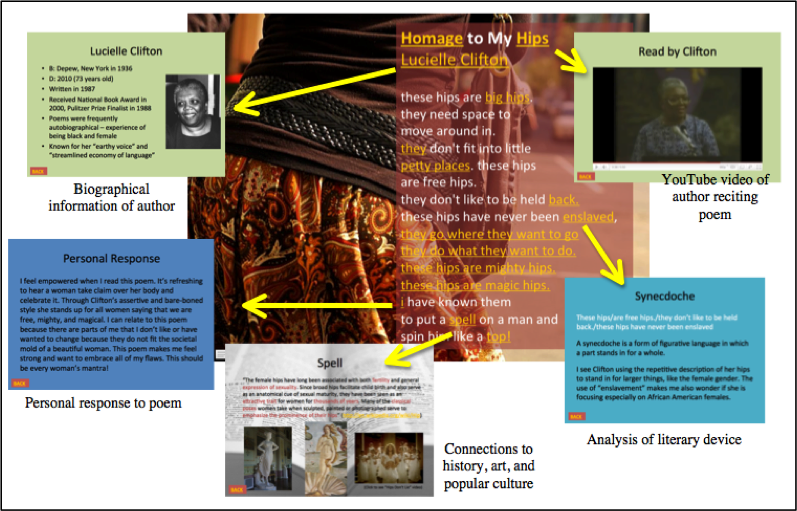 I’d love to hear more about how you are using the hypertext literary analysis in your class! I really like the idea of integrating academic and multimodal literacies, especially with a tool as versatile as PowerPoint. Thank you for providing such a detailed structure to follow. I am looking forward to implementing this project with my middle school students this year, and am interested in any follow-up items or activities that can be used in the future.